With a catch phrase of "Are you Tough Enough?" 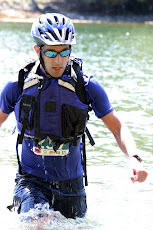 Kusam Klimb markets itself as an epic endurance event. With 1500 meters of elevation gain in 5.5km and some very challenging terrain, it lives up to its billing. It has even been listed by elite trail runner Dale Reicheneder (scroll down about half way) as the toughest race he has ever done. While I don't consider it to be quite as insane as Dale describes, if you have never done it yourself, mere descriptions don't convey the length and grade of the ascent. You can also read a longer article by Sarah Seads here. This was my third trip to Kusam (located near Sayward on the North East coast of Vancouver Island) in as many years and I have been fortunate enough to come cross the finish line first both times. In 2008, I had one of the best races of my career, where everything went right and I ended up setting a new course record of 2:23:04. Since I had such an amazing race last year, I knew bettering my time this year would not be easy. In addition, I found out that Adam Campbell was registered for the race and Jason Terauchi-Loutitt might make a last minute appearance. Even though I had prior knowledge of the course, I knew that would probably have to run the race of my life to have a chance of winning with those two on the starting line. I traveled up the night before with Sonja, Garth Campbell, and Joanne Rosen and stayed in a cabin close to the race start. Unfortunately, I had been feeling a little unwell that day and suspected that some sort of sickness was on the way. I just hoped that it would hold off long enough to allow me to race in reasonable condition. My sleep that night was terrible, which never helps. I tossed and turned all night and contemplated not starting the race at all if I woke up feeling totally exhausted and sick. I don't like to under perform I didn't want to start a race where I thought I couldn't muster a decent performance. Especially one that I won twice before. Six o'clock finally came I while I didn't feel great, I felt good enough to give it a go. I just hoped that once the climb began, I wouldn't fall apart! 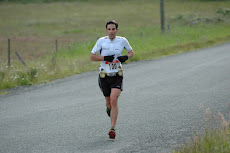 The race starts with a nice 2.2km on the paved road so in my mind, no warm up was required. I'd save all my energy for later in the race. I hadn't spotted Adam, Jason, or any other top talent that I recognized. As we began to gather for the start, I still didn't see them I began to think that I may have gotten lucky. I like a good challenge and had a I been feeling 100% I would have liked to see how I could have done against better runners on this unique course. However, I also like winning so I'll have to admit that wasn't too disappointed when they didn't make an appearance. Unlike last year, when there was a good sized pack to run with on the first road section, this year I found myself on my own within just a few hundred meters of the start line. A couple of guys with good sized backpacks swaying side to side did make an initial dash for it, but soon fell back. Fortunately, I continued to feel better than expected and moved ahead of the group in a relaxed, but sustained pace. By the time I hit the single track, I couldn't see any one else. In my mind, the start of the climb was the final test to see if I could be able to hold it together for the rest of the race. If things felt fine in the first 5-10 minutes, I figured I could pull it off. I wouldn't be breaking my time from last year, but I could hopefully still take the win and make it a 3-peat. Thankfully, the legs felt pretty good although my calves did start to tighten up quickly. Fortunately, after about 15 min they loosened up and I was able to climb in relative comfort (not that Kusam and comfort really go together). I reached the first checkpoint (3.7 km @ 390m elevation) at 23:52. After this checkpoint, the already steep climb starts to go vertical. While this is a running race, during the climb, there is very little running involved. It is a one long power hike punctuated by a few places where a jog is possible (if your legs allow it). Up and up and up it goes, with some rocky sections where you need to pull yourself up with ropes and some nice views if you take the time! It is often better just to put your head down and climb. Looking up can leave you feeling defeated when all you see if more is the same insanity. In the past two years since I have done the race, the course starts to hit snow near the top, but this year due to warm weather, pretty much all the snow was gone. This generally made for easier climbing as you didn't have to worry about slipping around on the snow. There is a small decent into a alpine lake followed by a final climb to the the col (pass), the highest point in the course (1482m). It took me 1:00:15 to make the 4km from checkpoint #1 to the pass. It is hard to imagine doing 15 min kilometers and thinking the are hard, but that is the reality of Kusam. This was actually about 1 min faster than last year which was quite surprising to me. My legs had held together pretty well, but they were still pretty toast by the top. I was ready for the downhill, but without the snow I was used to I didn't know what to expect. Previously, I'd just run down hill slamming my heels into the snow and forgoing the rope lines that had been placed to aid racers in their descents. This year, it ended up being a bit harder for me as running down such a steep (and I do mean steep) hill without snow would likely have led me to hospital. This time, I opted to use the lines as a safety and ran straight down hill (gloves are a must). I think this method was a bit slower, but I still made reasonable time. Once the steepest decent was over, we were treated with some great downhill technical single track that I had never seen before. This is a cool thing about Kusam, each year the race can be different depending on snow pack and rainfall. The single track didn't last long, but it was good fun. I reached the safety checkpoint at the end of the single track 12:06 after the summit and headed onto a steady decent onto an old road trail in a clear cut. This trail is relatively uneventful save for several good sized creek crossings where keeping the feet dry is not an option. After a couple of km, I passed checkpoint #3 and the course soon moved onto a 5km section of gradual downhill gravel road. While I would still prefer to run on trails, this road is actually not bad, as the gradual downhill makes running fast on tired legs seem fairly effortless. After passing checkpoint #4 in 28:48, there was 3km of slightly downhill overgrown logging road which is pretty easy except for where the road has been cut to allow streams to cross (and there a more than a few of these dippsy doodles). It took me 12:11 to traverse the logging road and a short bit on single track before being treated to another creek crossing with one rude little climb to reach the final checkpoint. During the decent I was feeling reasonable and up to reaching the final checkpoint I thought that I may have had a chance to better my 2008 time. However, with 2.5km to go and under 6 min to do it, it wasn't going to happen (it took 9:41). Still, I continued to push right to the finish coming across in 2:26:51, winning the day and posting the 2nd best time on the course. 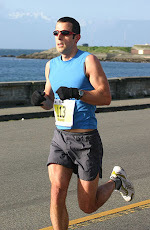 Second place would go to 2006 Kusam winner, Rob Fontaine coming in at 2:36:23. Joanne ran an amazing race, wining the woman's division in 2:53:25 and setting a new course record along the way. Not bad for someone who only decided to come 2 days out! The true "Toughest" award certainly has to go to Garth though, who was solidly in 3rd place with only 3km to go when he tripped and fell hard onto his right arm, dislocating his shoulder. Despite being in great pain, he managed and hobble to the finish line, only loosing one position. Sonja also raced well, taking about 12 min off of last years time. Most people would consider doing Kusam once a year enough, but how about twice in a row? For Randy Duncan it was just a bit of training for the Leadville Trail 100 Mile Ultra. He pocketed the first go in a respectable 3:22:08 and headed out for another grueling lap (passing some of those still doing the first one I might add). Final results are unfortunately no longer available. 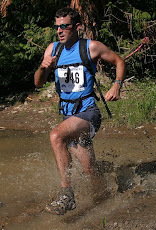 We have just added your latest post "Kusam Klimb" to our Directory of Sports. You can check the inclusion of the post here . We are delighted to invite you to submit all your future posts to the directory and get a huge base of visitors to your website. Congrats again Shane. If you see him around, regards to poor old Garth. Must have been extra frustrating was that the tumble was a fluke close to the finish and not on the really steep terrain. Couldn't believe he ran to the finish, and the ambulance took him away almost immediately and before I got to get a chance to congratulate him. Also regards to Jo, who I met and knew won the women's but was especially amazed looking at her time in the results. Interesting to visit and see the events you guys run in. Any good training tips, besides running lots of hills?! Have you found a good website with trail running plans?